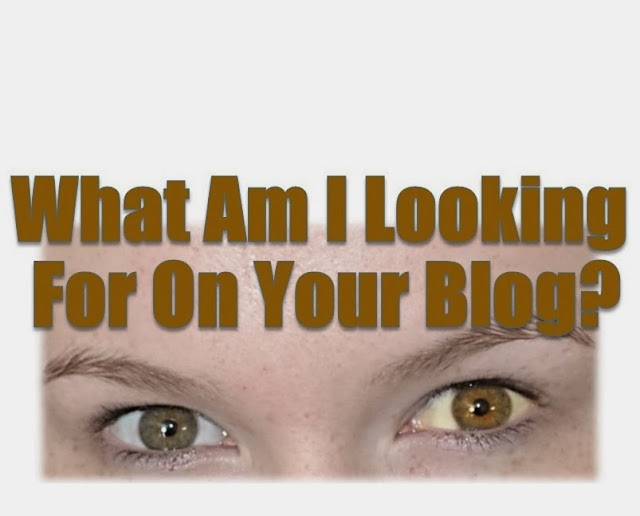 Darlene Nemeth: 7 Things I Look For On Your Blog? 7 Things I Look For On Your Blog? One of the things that I love most about blogging is visiting my fellow bloggers and checking out their amazing posts. Of course when I find something particularly interesting I want to share it. I want to know more about the blogger and I want to be able to follow them. Sometimes it can be so frustrating. But more importantly, that blogger is missing out - missing out on the sharing and following. Not that I am a super star blogger but every bit helps right. No matter where I start from, whether it is a Linky Party, Pinterest, Google Plus, what ever, I am first and always attracted to your post by the image you have on display. Everyone knows that. But did you know a tree in the forest does make a sound when it falls and no one is around to hear it? And that is something I am definitely working on. I started off with my regular digital camera but have upgraded to a Nikon DX. Mind you I love taking photographs and I wanted a better camera anyway. But holy cow, what a huge difference! I'm going to eventually go back and put better pictures on my older posts. Many bloggers use IStockPhoto, or Flickr for images and that's great if it works for them but it doesn't for me. I wasted so much time looking for pictures just to be disappointed. Oh ya, an awesome image isn't necessarily a professionally taken photograph. An awesome image is one that shouts out for attention. There are many different ways to attract attention, like through colour, lack of colour or just something plain fun. Sharing is caring! When I read something good, I want to share it. The easier you make it for me to share the better. If I have to work too hard at it I'll just skip it and move to another blog. I like Pinning. As soon as I realize that I like your post, I want to PIN it. And the easiest way for me to do that is to click on the Pinterest icon that appears right on your pictures when I hover over it. I don`t have to search for it or strain my eyes to see it. Done and move on. It has to be that simple. If you make it easy for me, I`ll even share your post on Twitter and Stumble. I`ll like your Facebook page. Make me search for those sharing buttons and I`ll likely just skip it. This is where I got my share buttons. Click HERE. It's free and easy. So I`m on your blog and I`ve shared your post. Now what? I want to see more. What else do you got? Anything interesting? Try showing off your popular post in your side bar. Or put "You Might Also Like" at the end of a blog post. Click HERE to add it to your blog. Either way, you'll keep me on your blog longer while I bebop from post to post. I don`t know about you, but I love seeing a picture of the blogger. It`s you that I can relate to. It`s you I want to follow. And it`s your writing I want to read. Plus I tend to remember you face more than a blog title. To me, your face is like your business logo. Memorable. Everyone likes to feel like they fit in. It`s a good feeling when I get to read more about you and find we have something in common. This alone could be the reason I follow you and share your posts. Is this true for you too? Once I decide to follow you please make it easy for me to do it. There`s nothing more disappointing to really like a blogger but can't follow them because you can`t seem to figure out where the follow me buttons are. I just changed my buttons. They were spread out but now they are grouped together. We'll see if it makes a difference. This is where I got my follow me buttons. Click HERE. It's free and easy. It`s all about the list. Well, that`s what everyone is saying. So make sure that is an option for me. Besides, lately I`ve noticed that I prefer to subscribe by email. Sure it means loads of mail but I find it a challenge to get my email back down to zero. I scan emails, reading and deleting as I go. I actually just moved this box to the top of my right panel and I already got more email subscriptions in this last couple of weeks than I did in the last year. Bonus. I use FeedBurner. Click HERE. Or if you prefer MailChimp, click HERE. To be honest, I don't know what the difference is and I can't remember why I choose FeedBurner. It works. I'm jumping up and down with joy. I can't thank you enough ladies. This mother and daughter dual, Debi and Charly featured this post on their fabulous blog Adorned From Above. I would like to thank the hosts of the blog hop for featuring this post. I am honored. To see the other featured posts and meet the hosts, please click HERE. Terri Henkels publicly sent out this invitation, "Stop by and see the post Features of the week by some creative and great bloggers." I'm doing a happy dance now! This post has been featured on the Blog Strut as the most clicked. Thank you Carol and Linda for featuring my post at your party. Check out the smiles on these lovely ladies. Hi Meg, I seems obvious but it wasn't for me. Dah! I'm still learning. I have to get an email list started! And I so totally agree about making follow buttons east to find! Hi Amanda, you have feedburner on your blog so you have an email list. Check it out - you should see my name there. Good luck. This is a great post! I am pinning it to my "e learning" board on Pinterest. Thanks Bonnie. By the way, I love your blog. I would love to know how to do a email list from my Blogger blog. Do you have instructions for that somewhere? Found you through Sparkles and a Stove. Hi Sharon, I just added a couple of links for email. I hope this helps. Hi again Sharon. You have FeedBurner as well. That means you have an email list. GREAT post! Thank you so much for sharing your thoughts on this. I'll be making changes to my blog accordingly. I love that there are helpful bloggers out there - thank you for being one of them! Hi Amy, glad you like my post and that you found it helpful. Wishing you the best. You know I thought about adding it to my bookmarks bar too but it's already too full. I'm assuming it works great for you. Maybe I should weed out my bookmarks bar. Thanks Meg. So happy you decided to stop by and leave a comment. Thank you Charlie. I am happy that you found this helpful. wonderful post, I too look for pictures and I want to know about you and I want to follow but please don't make me beg. Thanks for the pinterest on pictures, I have been curious about that. Hi Linda, thanks for the compliment. That's it exactly - don't make me beg to follow you. And your welcome for the hover button. Great tips and observations from your experience reading our blogs. It is really helpful information. Thanks for posting on our Blog Strut tonight! Thanks Angela. I was hoping it would be helpful. I totally agree with the pin button! I hate when it is not there and I can't pin. Most bloggers have the Pinterest button, but that is to follow them on Pinterest--not pin the post. I also prefer to follow by email as I can't delete after reading and don't have to think about it too much. I love that Pnterest hover button. It makes it so easy to share someone's content. PS Your granddaughters are adorable! I read the shopping post too. Now I must sew more. Hi Charlie, that's amazing - how quick you were able to add the widgets. You're faster than me. It took me forever to figure it out. I must have been tired. Working on my blog in the wee hours of the night. That's definitely. I was tired. That's my story and I am sticking to it. You know I was just thinking, it would be kinda cool if blog templates had all these gadgets already set up to easily personalize it. These are wonderful tips; it's all about engagement! These are all really great tips! I too have been on blogs and I want to pin, share or follow and I cannot find ways to do that. There are quite a few blogs that don't have the widgets. Me too for a long time. I wish someone had given me these tips. Really nice tips. It's so helpful for my own blog to make notes of what I'm looking for as a reader on other blogs. Share buttons as huge, as are easy ways to follow the blogger. Thanks for sharing. I'm sure there are a few that I have missed. I may need to update my post. Thanks for the tips! I just added a subscribe by email button, and I'm going to make a few other changes. Thanks for sharing at Submarine Sunday! Hi Tonna, Your welcome, I am so glad you found this post useful. You know when I first saw that Linkwithin widget, I was like that is so cool. I have to have it. Then it took me forever to get around to looking up how to do it because I assumed it would be hard. It's not hard when someone tells you how. Visiting from Organized31.com's Inspire Us Thursday LinkUp. These are great tips...but my latest pet peeve is I want "Previous" & "Next" buttons to easily read posts in order. I tend to get to each blog only once, maybe twice a week and then I need to catch up on all the posts. Good point. I know what you mean about reading posts in order. I generally check out the Archive if the blogger has it but that isn't always the case. Really good point. I'll have to look into that and revise this post to include it. Don't worry, I will give you credit. :) Thanks so much. Many great tips listed here! Thank you for sharing! There is always work to be done on blogs. I hope that in time I can have mine straightened out enough so that I don't have to be making changes every other day. I wish there would be such a day but realistically it will never happen. Just when you think you have it all figured out someone will change the game rules. these are all the things I have just been thinking about recently and wondering where to start to make them better, thank you. Hi Sandra, I hope this post is helpful. Great tips Darlene! Thank you for sharing. Have a good night. Hi Sara, I wonder if anyone has trouble navigating through my blog. I hope it is reader friendly. Hi Debi and Charly, I love joining the fun each week. Have a wonderful week. This is a wonderful post and so very spot on! One of the most amazing things about this bloggy community is the help that we can share with each other. Thank you so much for sharing on Meandering Mondays! Have a great week! Thanks Stacey. We can learn so much from one another. Great tips and very helpful. I agree with you. I too am working on the pinterest hover button. I didn't quit get it before. I'll keep trying. I'm going to share this with my social network. :) Be blessed and Merry Christmas. Hi Michal, I already checked and you have the Pinterest hover button! Congrats. Great tips that every blogger should read. I am so with you abou the Pin It button. Please make it easy for me to share your amazing idea (why make me work to help you out?). Thanks for sharing at Inspire Us Thursday on Organized 31. Hi Susan. Always happy to see you here paying me a visit. I'm glad you like the post. Applause. This post was awesome. I already made some changes, I couldn't figure out before. I'm grateful for your links. You are so very welcome Michal. Thank you so much for such concise information AND the links to get the jobs done! You are very generous with your knowledge! Thanks so much. By the way I love your blog. Hi fellow Canadian. Thanks for visiting. Hi Linda. You're making me blush. Thanks so much my friend. All good points! I have been frustrated many times when I couldn't find what I needed. Another frustration for me is when you try to tweet something and the tweet that comes up from the post doesn't have the blogger's twitter handle on it. I like for the person I am tweeting for to see the mention plus it allows for conversations to begin! I'm going to have to check my tweets more carefully. Thanks for insight. Hi, Darlene! I found your featured post at What To Do Weekends- thanks so much! I bookmarked several of the links you mentioned. :) I'm your newest fan on FB and Twitter....I tried to follow on Google+, but it will only show me your page for a split second then goes to a blank page. I run into this occasionally- I think it may have something to do with privacy...if I'm not already following you, I can't see your page...catch-22! ;) Anyway, I'm looking forward to keeping up with you! Hi Joy, I`m not sure what is happening with Google+. I haven't had that problem before. I wonder if my link is not working. When I click on it, it seems okay. I'll have to look into this more. Thanks for letting me know about it. Such a great post! I do the same things when I visit other blogs, but I never thought about the process in my mind. It was almost instinctive. It's great to know what other people are looking at to make sure that you have those elements on your blog! Hey Natasha, thanks for hosting the party every week. I'm glad you found this post informative. Thanks for sharing this on Tuesdays With a Twist, and the you also might like link. I never knew how to do it, thought it was an option that I didn't have. Pinning on my just because board, I have no where else to put it. Have a blessed and Merry Christmas. Hi Becky. your welcome. I am glad someone found this post helpful. When The World Says Give Up . . .
Happiness is . . . Shopping?